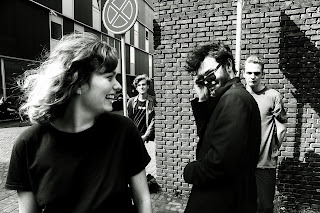 School is the latest single from Dutch teenager Pip Blom and her band, released ahead of their show at the Peer Hat in Manchester on Wednesday night as part of a short UK tour. Pip Blom and Band are: Pip Blom, Tender Blom, Camiel Muiser & Casper van der Lans. The Manchester show follows on from three really exciting performances earlier this year at Soup Kitchen, The Castle and more recently at Neighbourhood Festival where we described their performance as "With hair flying from side to side and an infectious energy that transmits itself from stage to audience, they run through a ten-song set that never once drops in pace or power. Songs are laden with irresistible hooks such as Babies Are A Lie, School and the modestly-titled Demo 2." Like the raft of singles that they've released in the past year and a half, which were compiled on a tour CD entitled Indie Robots, School is an energetic headrush of a song full of off-kilter fuzzy lo-fi guitars against which Pip's voice has to battle to get heard that recreates that excitement of their live shows. Pip plays Manchester Peer Hat (November 29 with Phoebe Green and Sprinters), London Shacklewell Arms (30) and Brighton Sticky Mike's Frog Bar (December 1).